The upstairs apartment with separate entrance features a deck with a panoramic view of the Seaward Kaikoura mountain range, Kaikoura bay, beach, and township as well as sea and mountain views from every room. The downstairs apartment was built for tourists also but has been occupied by the owners since 1995 after much pleading by the male (gardener and potter) partner. Great pool table. music, and private movie theatre, in former pottery studio. Lots of artwork everywhere. Exceptional star gazing. The size of the guest apartment is 50 sq meters. Bunks in the second bedroom, kitchen bench, and bathroom vanity were handcrafted and purpose built. A good selection of New Zealand books and artwork complement the tasteful decor and relaxed atmosphere. Free wireless computer access with good speed. Suited to whatever your degree of fitness and energy, there are a variety of walks, with stunning views that take you around the owners’ garden, the peninsula or down to the township. Significant discount for BYO linens. Please inquire if interested. Young children need close supervision as stairs up to the flat inside building are open at the top, the horizontal wires on the deck railing may invite climbing, and there is a pond in the garden. Check in 2:30 pm. Check out 11 am. High season tariff ($175 per night) applies at the time of Seafest weekend and the Kaikoura Hop. There is an excellent small home theatre in our pool room. Large garden with various viewing spots to which guests have access. The apartment is the upstairs of our house and has a large deck. Very much enjoyed our short stay in this beautiful, well thought out, completely self contained apartment. Views of ocean, bay, mountains, amazing sunsets from every room, yes even the bathroom. Balcony spans width of apartment and is a very peaceful and inviting place to sit and look at the stunning scenery and the lovely garden. Hosts kind and welcoming. Absolutely loved the 4 nights we spent here. Would not be the last time! I spent 2 nights in the apartment and enjoyed every minute; the view is to die for so is the wonderful terrace from where you can enjoy it. The apartment was perfect, super clean and well equipped. Martha and her family were gracious hosts and I felt so welcome with them. Thank you! A View to Dwell On. If this property was merely a pitched tent in a howling gale, a peek outside at the amazing view would make the discomfort worthwhile. The view really is that good. But this is no pitched tent. It's a comfortable, cosy, home from home, where a warm and heartfelt welcome from Martha, sets you up for rest and relaxation. The apartment is pleasingly decorated with original artwork and pottery adorning the walls and surfaces. Children will adore sleeping in the bunk room, with its little rectangular, cutout windows allowing them to see from from their sleeping positions, through the adjoining room to that room's windows and the glorious sweet dreams inducing views outside. A jewel in the NZ accommodation service, exemplary! We are thrilled that you enjoyed your stay so much and thank you for the amazing review. 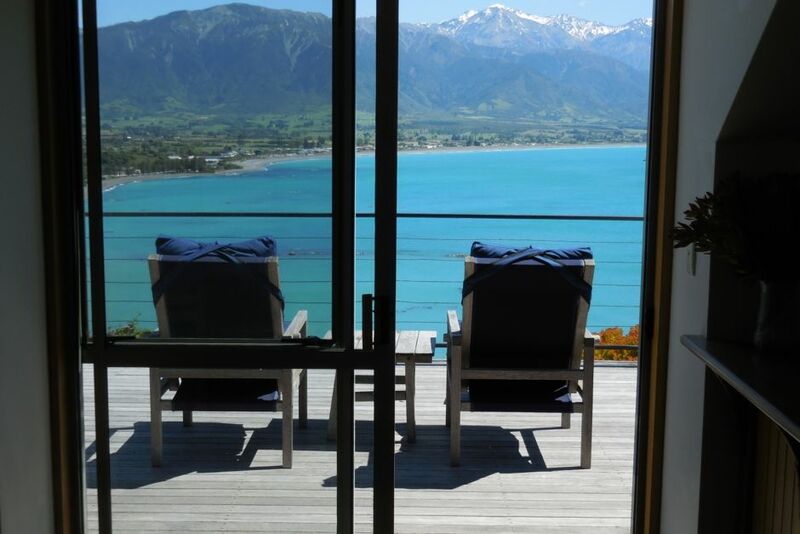 We agree that our view is one of the best you could find in Kaikoura or anywhere (when the weather cooperates) as is the location with its tranquility and lovely surrounding gardens developed by my husband. However some of our furnishings inside and out, are a bit dated and worn and I only iron pillow slips and the tops of sheets so I'm sure we are not 5 star in those respects ! As far as the ironing goes we will never be so I do not want your wonderful review to accidentally mislead anyone. Thank you again so much and enjoy the rest of your journey. Outstanding stay. I will definitely be back. Thank you. If there is one place to stay in Kaikoura, this is it.